This sharp, small-sized fluted projectile point (SLF-13) evidently had been lost by its maker before it could be hafted on a javelin or lance. Its lower edges remained unground. 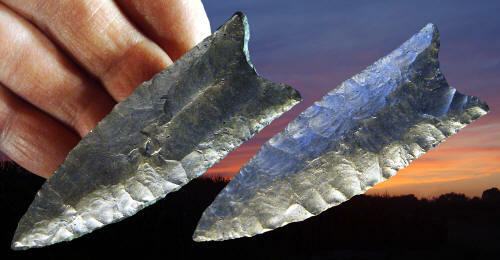 This rare artifact, which is fashioned of Normanskill chert from a source in the Hudson River Valley, came to light at a rich workshop (the “Ulrich Locus”) on the Sugarloaf encampment, where as many as 150 Clovis-style fluted points were manufactured 12,350 +/- calendar years ago. This projectile point may have been intended for use against caribou, who, it is hypothesized, moved along the Connecticut River valley before and after calving. Caribou hunting may have been pursued by descendant Clovis populations in New England and in Alaska hundreds of years after this economy and Clovis technology had been abandoned elsewhere in northern North America. This point measures 3 1/8 inches (8 cm) long.